Many of you may have seen my post on Tokyo Live Bloggers via dannychoo.com yesterday about the missing (stolen) statue in Shibuya outside of the station. 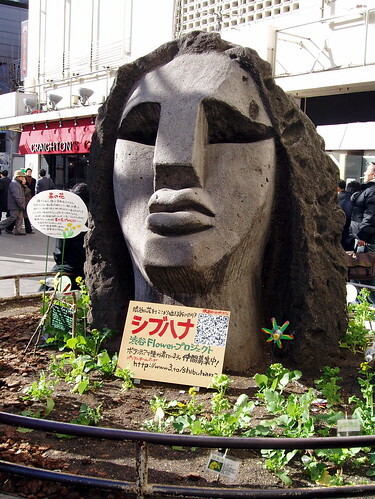 The statue was stolen (taken) as part of the Lupin Steal Japan promotion project. The aim of the project is said to be giving people back some “genki” in their lives. The official site for the project can be found at steal-japan.jp. It lists details of objects that have been stolen and asks users to submit ideas for what should be stolen next. I hope they don’t put in things like “Tokyo Tower” or “Tokyo Dome” ^^. Lupin was originally written as a manga series in Japan by Monkey Punch (Kazuhiko Kato), who I met years ago. NTV produced a series on TV and Toho studios was involved in a later movie. “The Castle of Cagliostro” (Lupin III) directed by Hayao Miyazaki is definitely worth a look if you haven’t see it before. Until recently there were copyright issues involving the use of the name Lupin, particularly overseas. The time limit to these rights has now expired and maybe NTV are planning a new release or re-release of some Lupin material some time soon? This clip was put together by HeadBangXter on YouTube showing The Castle of Cagliostro clips with music from the Foo Fighters. Interesting combination ^^. I had a few questions about what the Moyai statue looked like, so for those who don’t remember, here is what got stolen by Lupin. Thanks to Nemo’s Great Uncle on flickr for this. What would you like to see Lupin Steal Japan steal next? RT @Shibuya246: Lupin Steal Japan, Japan Anime | Shibuya246 http://bt.io/BOBw The master thief has struck again. Haen’t seen lupin in quite a while. The first time I saw him was on Cartoon Network. Always trying to be the sweet talking ladies man, and steal whatever he could. Always giving the inspector fits, just when he thought he had him, Lupin would find a way to escape. With or without the help of his gang. People of Japan be on the lookout for a smooth talking stranger with a heart of gold, but always ready to pilfer your valuables. Who will be the one to find the missing statue? I remember you posting this on your flicker acct. last night. very true. That’s right, I thought it was worth a follow up. When I took the picture yesterday I didn’t realise the statue had been taken just a few hours before. I thought maybe it had been missing for a few days and I had just noticed.